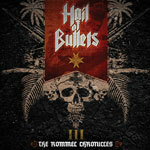 HAIL OF BULLETS launch landing page and first single from new album ‘III The Rommel Chronicles’! Pre-Order options and tracklisting announced! Dutch Death Metal giants HAIL OF BULLETS have launched the landing page for their new album III The Rommel Chronicles! 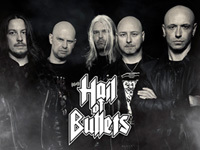 Surf over to www.metalblade.com/hailofbullets to listen to the first single Pour Le Mérite! Make also sure to surf through the pre-order options. There is a limited first edition Digibook available featuring the album on CD and an exclusive bonus-DVD. Of course you can also order a jewelcase-CD, vinyl or a digital download. Shirt bundles are available as well! III The Rommel Chronicles began to take shape in the second half of 2012 when HAIL OF BULLETS started writing songs for this third album which sees the band approaching things a bit differently lyric wise. Instead of describing a certain campaign or theatre of war, this album focuses on the military life, rise and fall of German field marshal Erwin Rommel. Despite fighting on the wrong side, Rommel was undeniably a great strategist who was both feared and admired by his enemies. Music wise III The Rommel Chronicles slightly harks back to the debut album. The songs are faster, rawer, more aggressive and direct than on On Divine Winds which had a more epic, heroic feel. Once again production duties were handled by Ed Warby and the album was mixed and mastered by Dan Swanö. A new lyrical approach also asked for a different type of artwork, which was provided by Dutch artist Erik Wijnands.